This past week was quite busy for me. I stayed late four out of the five days for a meeting, an event, and two basketball games. It wasn’t horrible in the slightest, just a bit tiring and invasive of my down time. Next week should be better, however. We have our last home basketball game, which is nice. It means the winter sports season is coming to an end in a couple of weeks. I take that as a sign that we are close to the end of the year. I can almost see the end of the road. Sometimes I truly wonder how my team and I have gotten where we are now with all the mayhem that has occurred. The other day, my manager said that once the school year is over, we’re all going out for drinks. I think that is a grand idea and I’m completely up for it. I decided today that I’m going to start taking a photograph everyday, like Gene. He said he doesn’t mind me copying him and I think it’s a good way for me to get into blogging again and to attempt to be a tad more creative. I would like to do it for at least a month but after that I have no set goal. I feel like 30 days is a decent place to start. 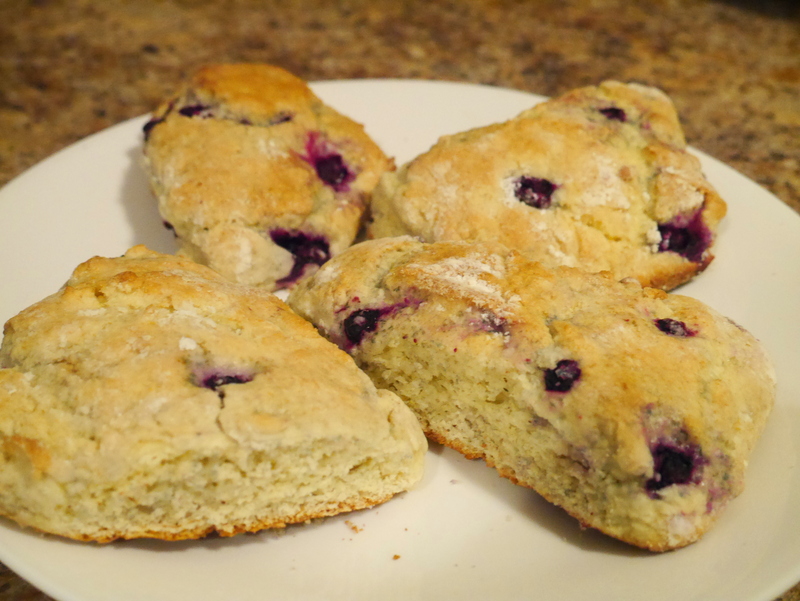 Today’s picture is of the scones that I baked for breakfast. I used some of the huckleberries that Lydia gave me a year ago. They’re holding up pretty well in the freezer, but I should definitely use them more often. I promise I’ll try not to take too many pictures of food, but sometimes it will be a must. These scones were quite delicious. They were light, fluffy, and had the perfect amount of sweetness. They were filling as well. One scone was probably enough for me, but I ended up eating 2 1/2 (food discipline is still something I’m working on). I used this recipe, but instead of blueberries I used huckleberries (obviously). I also skipped the glaze, no one needs that. The recipe made 8 scones. They rose more than I thought they would while baking, which I thought was a plus. The dough was quite sticky and not quite what I considered a dough, but I didn’t want to over mix it like the recipe warned so I stopped stirring after a while. The scones turned out fine so I guess a sticky dough is okay. This recipe has now been added to my recipe binder and will be used many times in the future. I went over to a friend’s house later today for lunch and spent a couple hours over there. Then I came back home, went on a walk with Gene, and have been relaxing ever since. I am truly enjoying this weather, and although I know it won’t be like this forever (we’re bound to get snow a few more times), I am just thrilled that it’s still light outside at 4:30 PM. I have made it through the dark period, and that is a thing to celebrate! Next Post Darkness be gone! I want your scones so badly~~ looks delicious!